No, Really. You don’t have to be a rocket scientist…or any kind of scientist for that matter, to be a skeptic. Learning a new way of thinking is pretty scary. You wonder if you’re doing it right. Especially when you read posts on the JREF forum. It’s hard not to feel a little less than intelligent. The wonderful think about the skeptic community is that we are a pretty diverse group. We have members of all ages, genders, ethnicities and education levels. One of the major players in the skeptical world, James “The Amazing” Randi, didn’t finish high school. He has traveled the world performing magic and working to educate people about charlatans and frauds. Mr. Randi is working on his 10th book currently. Penn Jillette is a graduate of the Ringling Brothers Barnum and Bailey Clown College. Teller, his partner, formerly taught high school Latin has been a guest lecturer at Oxford University and appears to have attended MIT. So even within famous skeptical partnerships there is a wide range of educational background. Penn has written numerous essays and a book, “Sock”. His communication is insightful and thought-provoking. While he comes across as brash and overbearing, his writing indicates a much greater depth. And then there’s me. I’m one of those jack of all trades types. I don’t have a formal college degree though I’ve attended Northwest College as a photojournalism major. Turns out I have no talent for photography so I dropped out. Then I tried animation at the Art Institute of Atlanta. I changed majors to graphic design because the redundancy of drawing frame after frame with only minute changes drove me nuts. After a year and a half of graphic design I quit because I didn’t see how a degree in that field could be of help to anyone. I saw it as crass manipulation and I didn’t want to manipulate people on a mass level. Or any level for that matter. Later I spent a year with the psych department of the University of Maryland. That’s where I took what would later become my favorite college class ever. Statistics. Even though I felt like my brain was leaking out my ears and half the time I didn’t think I had any clue what I was doing, that course taught me how to read medical studies and evaluate research. This is probably the most important skill I have. Unfortunately after that year I didn’t feel that I could, in the end, be of help as a psychologist. I don’t think I have what it takes to listen to people’s problems day in and day out for years on end. So I dropped out. Intertwined amongst all that is over 500 hours of training in various disciplines of hypnotherapy. There is no formal degree in hypnosis, though I looked at several unaccredited “universities”. When we moved to Florida my hypnosis practice collapsed. I still have that skill set though because I am a skeptic, I have set it aside. We still do not really understand how hypnosis works. I’ll be covering that in a later article. Then, of course, there is all the time and money spent on training in Reiki, crystal healing and herbalism. The point of this long, rambling bit of text is that even though there are lots of people with big, intimidating degrees from MIT, Oxford and Harvard, it’s people like you and me, the average person, that makes the skeptical movement grow. We learn new ways of thinking and exploring our world right here in our own living rooms. We go to skeptical events, we share ideas with others that may or may not be skeptical. This is how the skeptical movement grows. With people like us just being skeptical. I hope someone can explain to me what that last quote means. I can’t quite make sense of it. What conflicts are they referring to? Is this their way of saying that Wakefield did NOT commit fraud? Oh no. no indeed. As this article will show why_am_i_not_surprised_it_looks_as_thoug.php Wakefield is guilty of the same things that the antivaxers accuse Paul Offitt and many other doctors of. I know from listening to James Randi speak that you cannot change the mind of a True Believer. All we can do is plant the seed and hope that somehow the truth will take root. 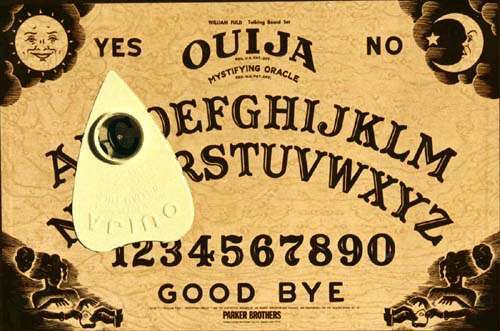 When I was little we had a Ouija Board in our house. It was fun to play with because the little planchette seemed to skate across the surface of the board all by itself. When I had sleep overs, we had “seances”. It was fun and kind of scary because ghosts were talking to us by moving what we called “The little thing”. Girls at that age were, as they are now, boy crazy. So of course the big thing we all wanted to know what “What are the initials of the man I’m going to marry”. Even then I found it a little odd that one set of initials that came for me was MM. Those were my maiden name initials. It was fun to get ANY kind of feedback, no matter what the initials were. We all just laughed and guessed who it would be, naming boys we knew at school. When I got a little older, my Mom told me a story about her grandmother (my great grandmother). She and her friends were having their own “seance” while they waited for my great grandfather to arrive. One of the questions that she asked was “When will my husband die?”. The planchette pointed out the date of the following day. According to my mother, my great grandfather died in a car accident that next evening while on the way home from work. I have not verified this story with any of the other relatives. I don’t know if this is true or if it is just part of the family mythology. Either way, my mother swears by this story. Here’s why a spirit or ghost did not predict the death of my great grandfather: Ideomotor effect. The ideomotor effect is an unconscious motor behavior. In other words, we do it without realizing that we’re doing it. Dowsing and a pendulum work the same way. What happens is that our muscles twitch involuntarily. It’s similar to when we breathe without thinking about it. If you hold a pendulum you’ll notice that after a brief period it will start moving on it’s own. This is an example of the ideomotor effect.